Medical College of Georgia, August, GA 2008 – 2012 M.D. Pariser Dermatology is pleased to welcome James P. Bota, M.D. to our practice. 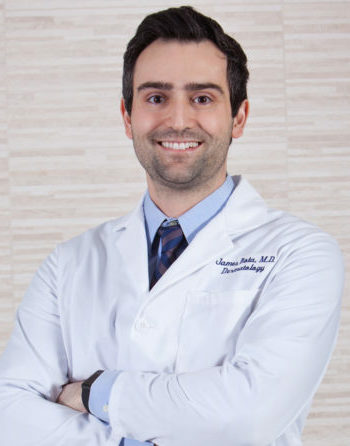 Dr. Bota is a board-certified dermatologist and fellowship-trained Mohs Surgeon. He completed medical school in Augusta, Georgia at the Medical College of Georgia, followed by a residency in dermatology at Eastern Virginia Medical School. He then completed a fellowship in dermatologic oncology and micrographic surgery under the renowned Mohs surgeon, Dr. Mary Maloney. He specializes in the prevention and treatment of skin cancer, high-risk skin cancer, and advanced facial reconstruction. Mohs surgery is a form of microscopic margin-controlled surgery which enables Dr. Bota to remove skin cancer with accuracy and precision. He has published articles on skin cancer in peer-reviewed journals, and enjoys to teach others about the impact and treatment of skin cancer. In his spare time, he enjoys playing the guitar, mountain biking and an occasional Netflix-binge. A proud father of baby twin girls, Dr. Bota and his wife reside in Norfolk. "A very friendly and professional group. I was pleased with the results and shall return to see Dr. Bota if necessary." "I was very pleased with my overall experience, both with dermatology and Dr. Bota's staff." "Very positive experience and I felt very well cared for. Dr Bota was very reassuring and I was never nervous." "Follow-up to surgical procedure. Doctor Bota is the best!" "Dr. Bota must be your very best representative. He was a very careful, competent and skilled doctor who has much pride in his profession. I will always seek his help above all others."